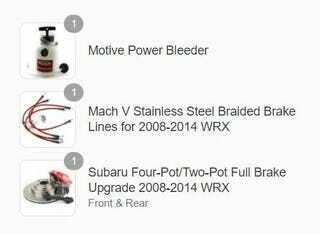 WRX on blocks update V: MASSIVE brake upgrade on the way!! I hope this will fix the sticky caliper issue I was having... really though, the downpipe/intake that are also going on this week will allow for a 300 HP/TQ ECU reflash. Given that the car weighs 300LBS less than a new STI, keeping the cheap brakes (which Subaru downgraded from the early 2000s models despite adding more power to sell the STI) would be blatantly irresponsible. First and foremost, I didn’t want to have another caliper fail on me, which happened twice on mountain drives over 100 miles from home. That’s what led to starting this little project in the middle of February... outside. Anyway, the old hardware had to go. All of it. The lines too; I never liked the pedal feel, especially while approaching corners much faster after the first reflash. Exciting! I’m expecting a night and day difference. Any (high temp?) brake fluid recommendations?